At several well-known speaker events recently, I have noticed a distinct lack of the one key ingredient that any college event needs: students. 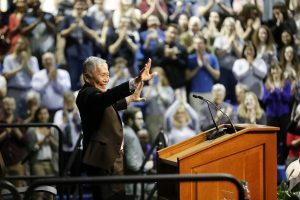 Even George Takei’s recent talk didn’t fill the gym completely, and lesser-known speakers often have even sparser attendance. Over my three years at Rollins, I have attended many lectures and academic events that saw barely any student representation. While I was studying abroad at Lancaster University last semester, I attended a guest lecture that was surprisingly well-attended by both students and staff—and it made me wonder what Rollins could do better to get students more involved in campus affairs. I think the main problem with campus participation is that students are simply oversaturated with schoolwork. Many also have part-time jobs off campus or here at Rollins, are involved with executive positions in campus organizations, and participate on sports teams. Even being involved in a few areas of campus life outside of the usual schoolwork can be overwhelming, and the easiest option for an overworked student is to collapse into bed at the end of the day—or during any break between classes and schoolwork, honestly—and binge watch Netflix, play a videogame, or scroll through social media. The second problem is that students seem to feel overwhelmed by the amount of events, both academic and otherwise, on campus. When presented with too many options, it’s easiest to just not do anything. Essentially, famous guest speakers and campus proceedings have become almost mundane—hectic schedules seem to cause a sort of “we-can-skip-this-week’s-speaker-there-will-probably-be-another-next-week” mentality. This overload of speechmakers and festivities leads to another problem: it can be difficult to make students aware of specific events. Promotions and mass emails on Rollins campus have become so extreme that it is easy to ignore almost any advertising, except possibly word-of-mouth. In order to get more students at speakers’ performances, the majors and minors involved need to think of an extra incentive for them. Perhaps this could look like some sort of award or honor within the department. For example, if a student attends 15 English Major events over four years at Rollins (this could include Winter With the Writers, Sigma Tau Delta, Writing Workshops, etc. ), they might receive something additional to put on their resume. Though this may not make many undergraduates actively attend all major get-togethers, it might evoke the same mentality that many students seem to have when they pick up a new minor. Something along the lines of, “I have already completed most of the classes by accident, and I’m sort of interested in it; I might as well finish it.” Lancaster University runs a similar program, which awards undergraduates bronze, silver, or gold levels based on participation. Instead of rewarding attending speaking or academic events, they count activities like campus involvement and volunteering towards the award, which was developed with the help of different employers. Rollins also needs to employ better organization. There should be a more accessible school calendar that is heavily advertised on social media which actually includes all of the academic and speaker events, as well as student club meetings, faculty gatherings, and campus-wide initiatives. Some organization and motivation would go a long way when it comes to bringing in students, but considering the amount of work that often comes with being a full-time Rollins pupil, I’m not sure we can blame people who would prefer taking a break instead of attending another academic event.